In 1958 the fame of the 1955 Chevrolet Biscayne was soon to end its short run at stardom when it was condemned to be cut up and crushed at Warhoops Junkyard in Sterling Heights, MI. Luckily for the Biscayne the GM executive who had been burdened with the task to ensure that the Biscayne was cut and crushed was in a hurry to get home to celebrate the Christmas holiday with his family and he decided not stay to watch the final blows that would forever seal the fate of the Biscayne to mere scrap. The conscience of Harry Warholak, Sr., the owner of Warhoops, would not allow him to finish the job and the Biscayne was scattered in pieces around the junkyard where it lay neglected for almost a quarter of a century. Joe Bortz who had been searching out the lost artifacts of General Motors, Chrysler and Ford concept and dream cars had heard the rumors about concept cars in junkyards but it wasn’t until his son Marc who upon reading a side bar in Automobile Quarterly about Warhoops suggested to Joe that they contact Warhoops Junkyard. Long story short Marc reached Harry Warholak Sr. at Warhoops who had heard of Joe and his quest for the lost treasures of General Motors and after a lengthy phone chat Joe was on his way to Sterling Heights to meet with Harry Waholak Sr. at Warhoops Junkyard. 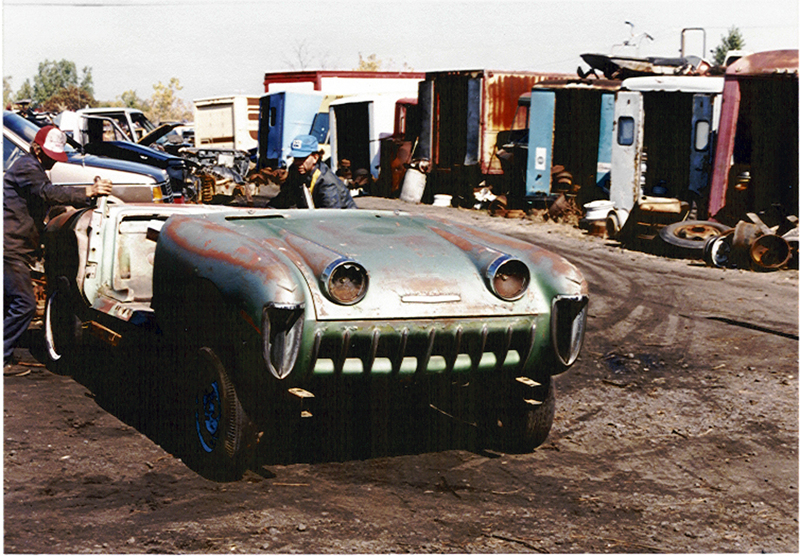 It was a very exciting and memorable day when Joe excavated not one but four 1950’s concept cars that day from the piles of twisted metal and fiberglass heaps. Not knowing what to do with the Biscayne that was literally in pieces he put Biscayne project aside for years while his attention was focused on other easier restoration projects. After the frustration of trying to move the Biscayne pieces around Joe consigned a very talented friend to glue together the fiberglass body of the Biscayne back into some semblance of its original shape. Eventually the Biscayne body was glued back into one piece but it was still missing a chassis. After this project was completed, the Biscayne once again sat neglected while Joe pursued other car projects that were more realistic. Then one day, what Joe considered a miracle; General Motors sent the original blueprints for the 1955 Chevrolet Biscayne chassis. After almost 50 years of being in desperate condition Joe decided it was time to put the Biscayne back into a running vehicle. So after much research Joe found the perfect man to construct the chassis per the original Biscayne blue print. This was a very time intensive project but the day that the body was placed on the chassis was a major historical event in American automotive history. Now that the Biscayne had its wheels back under it and was somewhat back to looking like a shadow of its former self, Joe proceeded to research restorers who specialized in fiberglass. The car spent over a year being reassembled to make sure that it was ‘in square’ and with due diligence to the original blueprints the car was put back into a condition where it was respectable enough to join the other General Motors concept cars back at the GM Tech Center in 2008 for an amazing reunion where it stood its own against the beautiful concept cars that hadn’t been rejected and nearly destroyed. Once again, only weeks later, it stood proud at the 2008 Pebble Beach Concours d’Elegance with other famous General Motors concept cars from the Bortz Auto Collection to help commemorate the 100th Anniversary of General Motors. This would be the first time since the inception of the Pebble Beach Concours d’Elegance that a car would be shown in totally unrestored condition along with the unrestored 1955 LaSalle roadster, but it stood on its merit for its impact on General Motor design. Upon arriving back home Joe realized that it was time to give the Biscayne the restoration that was so well deserved. Now after a year, the 1955 Chevrolet Biscayne has been amazingly restored to the condition of its former glory days at the 1955 Motorama. Every detail has been carefully recreated to restore the Biscayne so that it will show as beautifully and exactly as it was so long ago. For the first time in a flash back to the 1955 Motorama it will be shown in restored condition at the Concours d’Elegance of America at Meadow Brook on Sunday, July 24, 2010. For a moment 2010 becomes 1955 again. 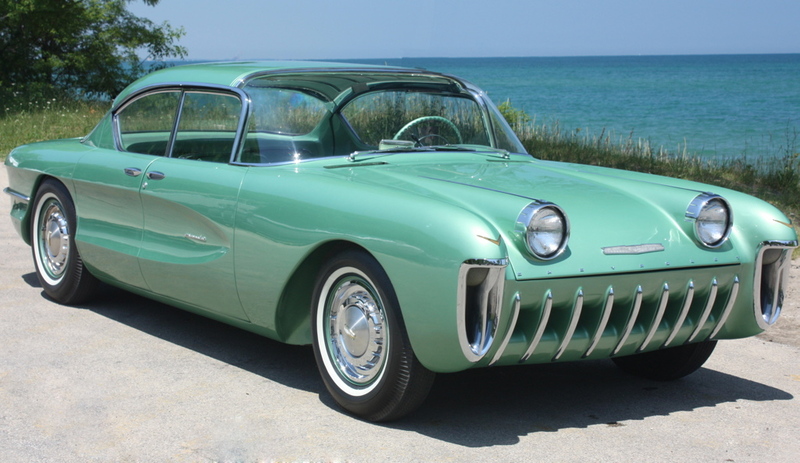 This entry was posted in Car Collecting and tagged 1955 Chevrolet Biscayne, General Motors Motorama. Bookmark the permalink.